Note - Allow 4 business days prior to shipment from the DapperLads store for this US made tuxedo. Add shipping time in transit to this - including expedited shipping. 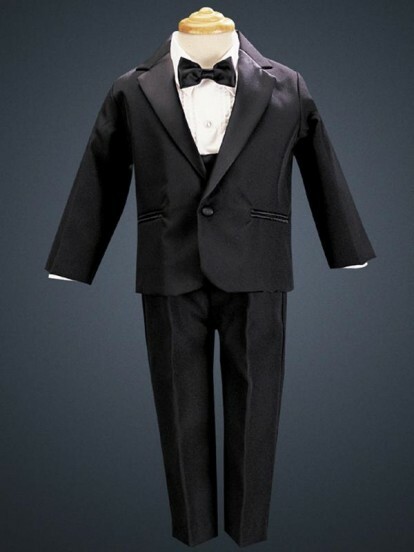 This is a top notch better brand 1 button tuxedo with cummerbund is from Lito Children's Wear. The tuxedo suit complete includes fully lined jacket with a matte satin notch collar lapel, Tuck pleated cotton-poly tuxedo shirt, black cummerbund, bow tie and tuxedo pants. The tuxedo dress pants have an elastic back. Infant sizes have a mock fly. Order up a size when in between sizes as the tuxedo runs on the small side. See measurements of the tuxedo in the Lito size chart and also refer to the general size chart for body measurements.